Now that I have had a few months to digest my Sar-El experience of February (2013), I wanted to share some of my thoughts with you. As with most other first time volunteers, I was not sure what to expect when I arrived at the airport in Tel Aviv with instructions to meet in front of the "Swarovski booth". Forty-five years ago when I reported for duty with the US Army, it was certainly not at the Swarovski booth! My first encounter with Sar-El was with coordinator Pamela Lazarus who bore no resemblance to my long-ago drill sergeant. Pamela was clearly in charge, but needed no uniform or bluster to display command presence. It was the first indication that I had that things here would be different. Sar-El and the IDF were profoundly different from the military that I knew. In Sar-El we followed orders because we wanted to and because orders were communicated in a collegial, outcome-oriented and egalitarian manner; we were all pulling in the same direction with no personal agendas! Soldiers, civilian supervisors and volunteers all knew the stakes - there were no slackers. I felt at home in Israel even though it was only the second time I had been there. When I went to sleep the first night (on my half inch thick worn out mattress), I was emotionally in my own bed. My barracks mates, whom I had just met, were my family-Jews from around the world with whom I shared common ancestry and common beliefs. I immediately liked them and trusted them-and put up with their snoring as they did with mine. In the morning at flag raising, it was difficult to get out the words of HaTikva while watching the blue and white Magen David hoisted into the Israeli sky. It's hard to sing while you're all choked up. I'll do better next time-maybe. As you know, the living conditions at the base are not wonderful and the food was a shade less than gourmet. It didn't matter! I wasn't there for the ambiance or the cuisine. I slept well because I was happily exhausted, and I ate well because I was hungry. Both my fatigue and hunger were well earned. I loved every minute. I came home from Israel with a Sar-El tee shirt, a hat and a pin. They are among my most valued possessions. The graduation certificate along with my ID card and a few snap shots of me wearing fatigues have already been framed, and hang proudly on the wall next to my diplomas and the other self congratulatory memento's of my life; in many ways, they mean more. By the way, I also came home with a set of IDF fatigues which I purchased in Tel Aviv. My prior military experience instilled in me a pride of uniform which required a well-fitting clean and pressed appearance. The work uniforms which we were issued didn't meet my self-imposed needs, so I gladly made the investment and will wear my uniform proudly when I am back on base the next time. Now the real reason for this letter. The Sar-El experience is life changing. I don't think anyone can do Sar-El only once. Eretz Yisrael is not just a country, and not even just the Jewish nation. It is the emotional, intellectual and existential center of every living Jew. You can't understand it until you have been there-it can't be explained. Writing a check to UJA or paying to plant a tree in Israel will no longer suffice once you have made a contribution of Avodah (work). 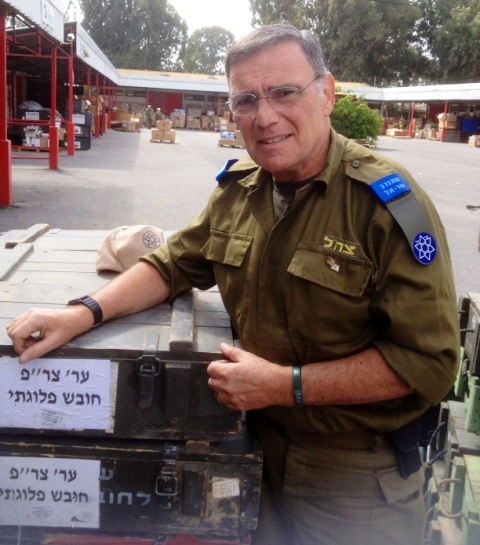 For many of us who are looking to make a meaningful contribution to our fellow man after retirement, you will never feel better about yourself than taking orders from a nineteen-year-old IDF corporal who could easily be your granddaughter. I urge you to endure the fourteen-hour flight to Ben Gurion, the aches and discomfort of the work and the frustration of communicating to young Israeli soldiers that they are not alone, and that you gladly pay your own way to work side by side with them for the elevating experience of laboring in the fields of goodness and righteousness. Thank you Sar-El for making all of this possible, and thank you IDF for defending our land.